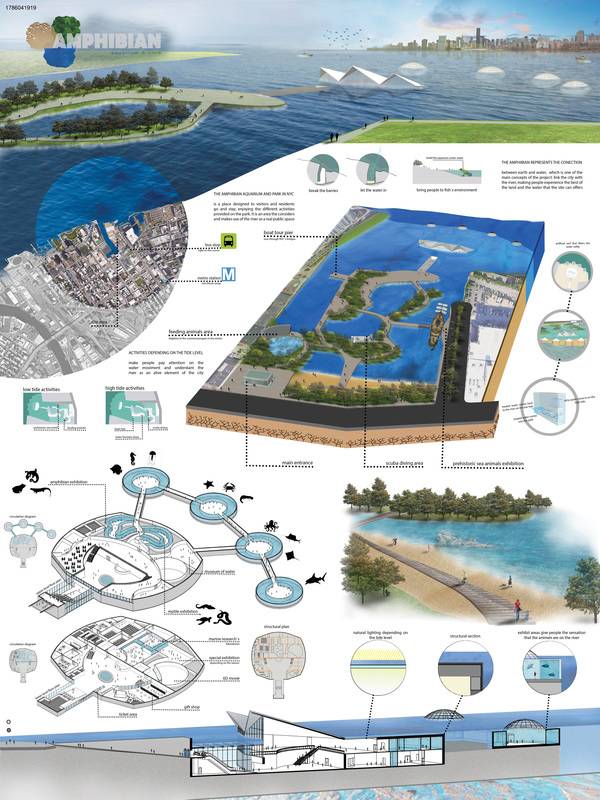 The estuarine system of the NYC Harbor is a complex organism. Fragments of industry, environment, and infrastructure intersect at the mouth of the Hudson as it empties into the ocean. We have become too busy to idly witness the power of this hydrological gesture. 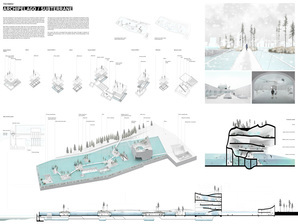 This unique system of waterways, biomes, and habitats creates an opportunity to foster an educational foundation in the biota of these specific regional phenomena – and a closer physical proximity to the churning water. Trash is one of the main pollutants of the ocean. 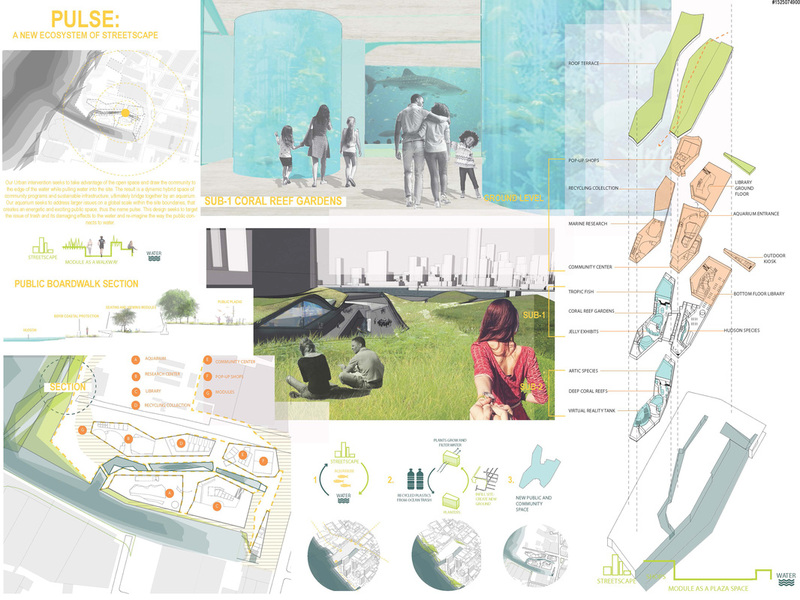 Our design uses recycled trash to create 3D printed modules to form a new ground surface between the urban streetscape and Hudson waters. The crossing of these two spaces creates a hybrid of urban space sustainable impacts- ultimately forming an aquarium of the new age. 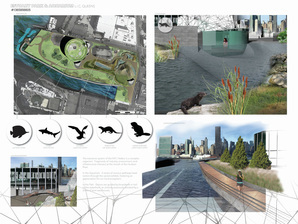 Modules house plants that filter the Hudson and also form the new boardwalk. A central focus of the aquarium highlights the process of cleansing the Hudson through live interactive screens and the exhibits showcase a variety of species throughout the world and in the Hudson. 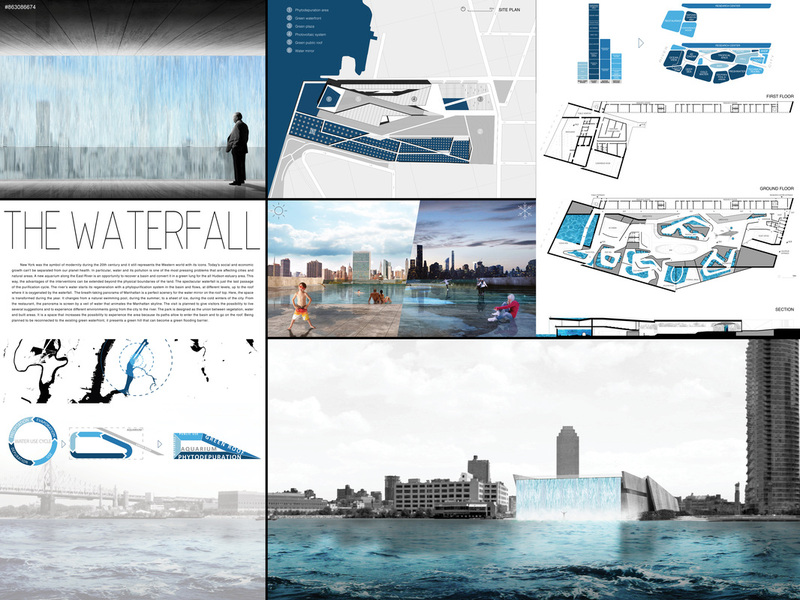 In order to respond to a complex situation, a space of fluid current needs be formed. A fluid space is not limited for a single purpose but can be used as a multi-purpose space that draws for various satisfactions of users. 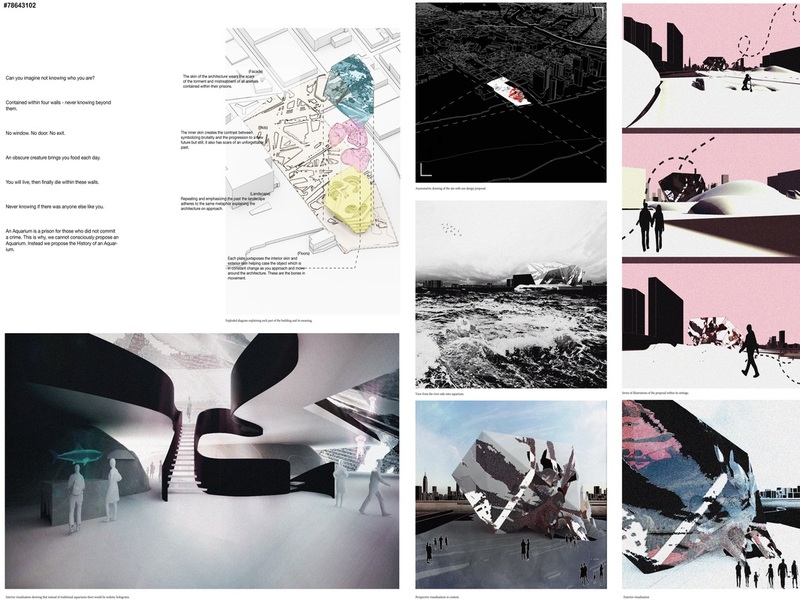 A flexible space appears at places for adjusting to a changing environment and an existing gap. 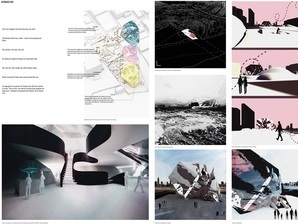 Providing a free flow to users results a fluid circulation as a reaction to the surrounding environment. This continual circulation is able to provide a sort of liberty to users so that they can accept various programs, produce the continual flow themselves and earn the ‘unexpected’ experience throughout the movement. Our water systems are fragile. The East River alone suffers continually from water quality issues, which is only exacerbated by rising sea levels. 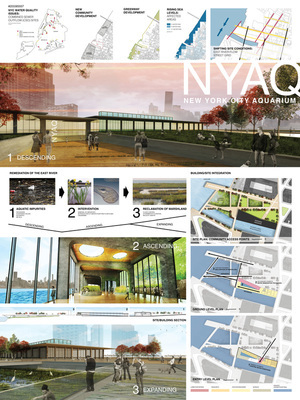 The New York City Aquarium proposes potential solutions to these issues while educating community members about improving water quality in the East River. 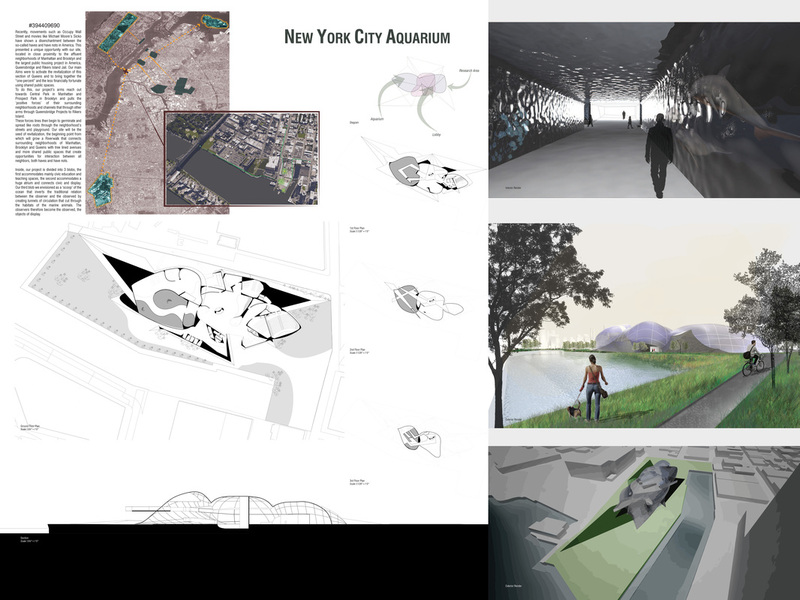 The integrated experience throughout the aquarium and site represents, both physically and conceptually, the water remediation process. 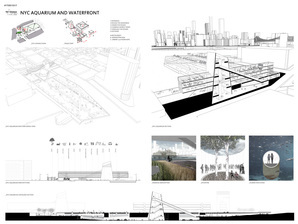 Through a series of ramps, visitors descend, ascend and finally expand toward the future as the site drops away revealing a reclaimed waterfront. 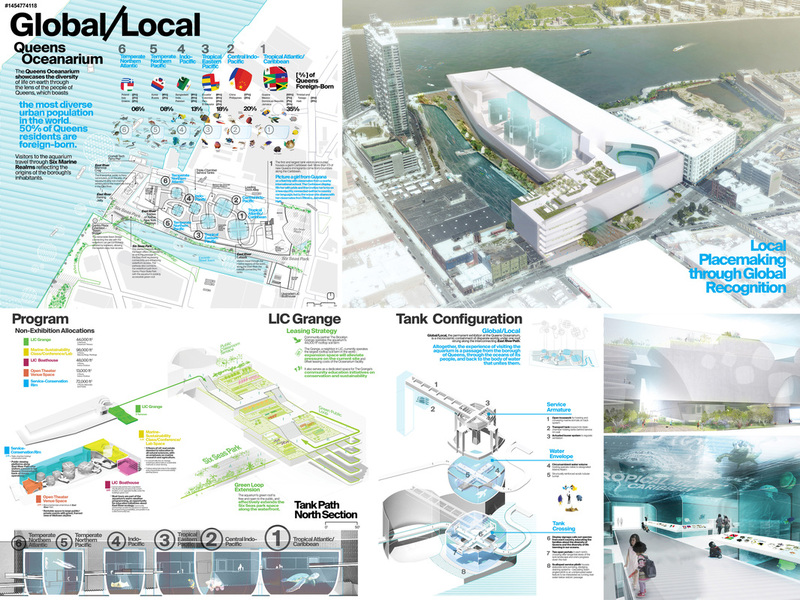 The new aquarium project proposes a mix between the rhythm of the visitor and the rhythm of the community. The aquarium is only the generator of a complex program that addresses to a wide variety of users (tourist, researchers, administrative staff, neighbors, students…). 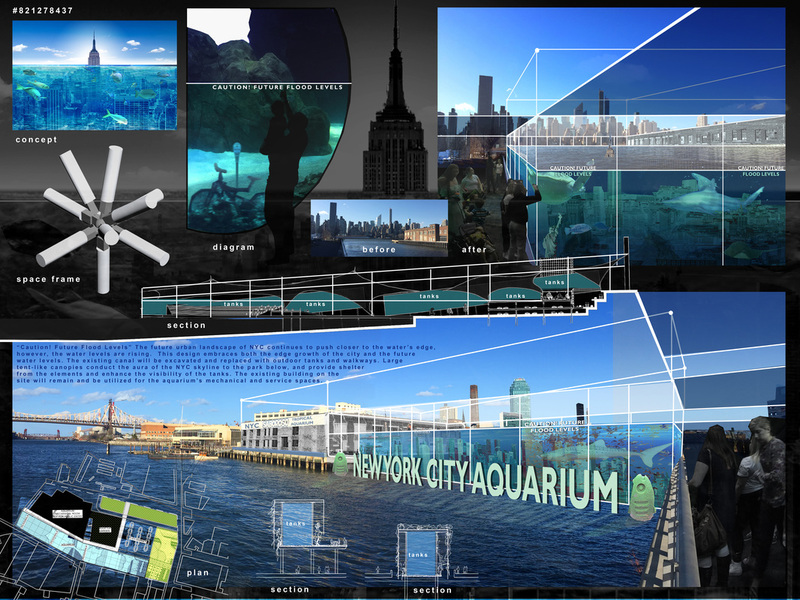 An aquarium, an exhibition area, a public library, a restaurant, a café, an outdoor cinema are all suspended vertically to encourage at every level a panoramic view on the Manhattan skyline. 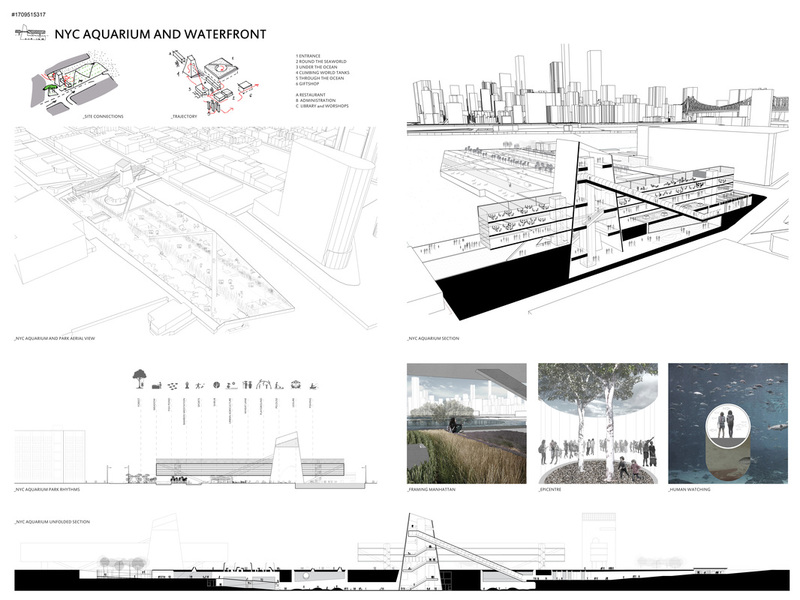 The building also tries to be the least intrusive and it sinks into the ground, leaving the site to a beautiful waterfront park that welcomes several activities such as sports, fishing and urban agriculture. 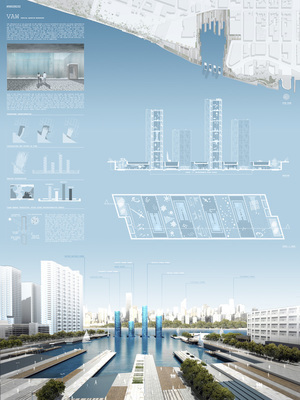 Water is the key element of the project. 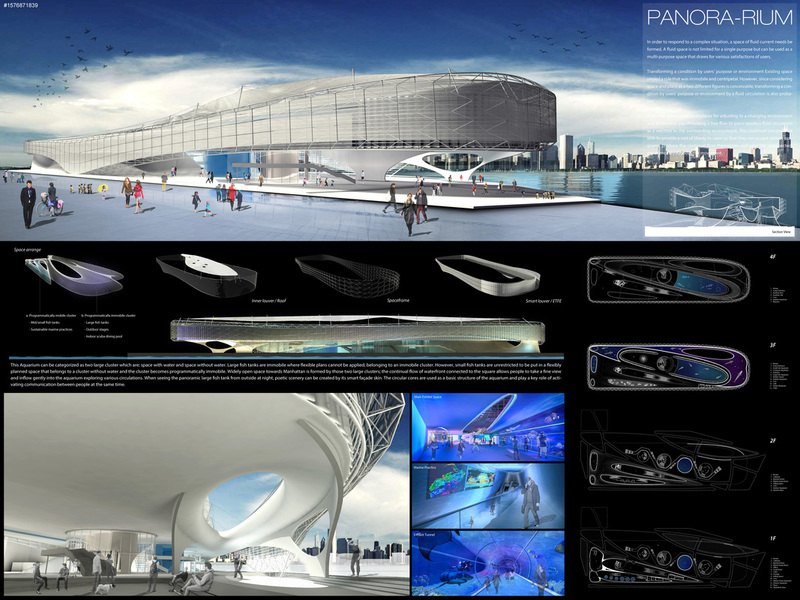 It strongly characterizes both the building and the park. Green areas are intended as a new lung for river's water, thanks to phytodepuration The all park is thought as a small cell to be reconnected to existing green waterfronts. The building is a concrete mass modeled to contain and dress water. Both the riverfront and the interiors are shaped by it. A green ramp starts gently from the park, connecting the plaza and the viewpoint on the roof. Here, the water is transformed in a mirror lake that reflects Manhattan lights. NYC Vivarium is an incubator of human and aquatic worlds which questions the role of the spectator and the spectacle within the natural ecosystem. Vivarium is the solution to issues of both gentrification and hierarchical society in the context of the neighborhood of Queens. It’s a place where living forms can come together from all positions in the hierarchy to coexist. 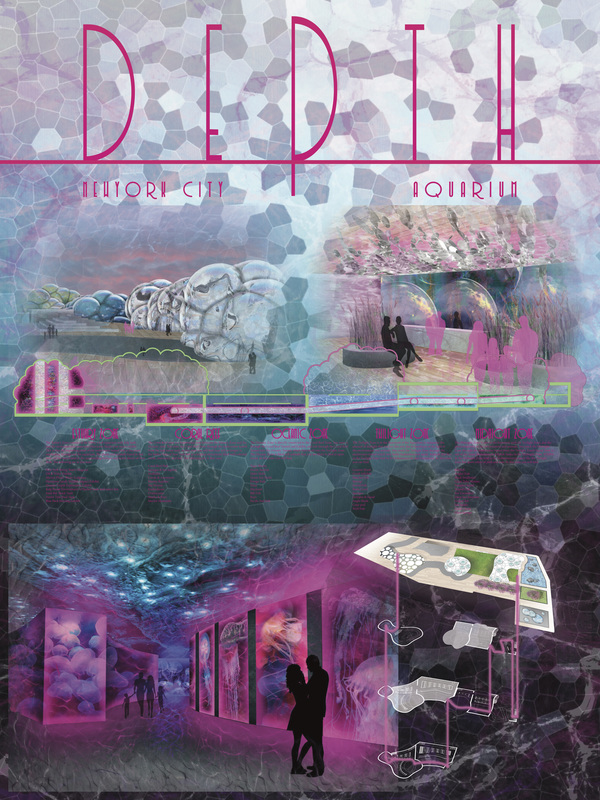 The visitor experiences the incubator as a series of programmatic pods while observing different species within the vivarium. The journey concludes within the floating glass box where the role reverses and the spectator becomes the spectacle. Considering the East River as a huge public space underutilized, the project idea was born from the principle of do not go against the river, but break down the barriers and letting the water into the site, creating a real relationship with the waterfront of NYC. 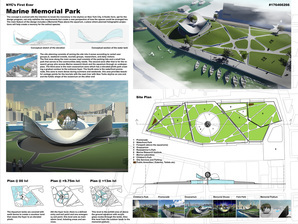 Once flooded, the site gives place to a public park surrounded with different activities which depends on the tide level to be open. 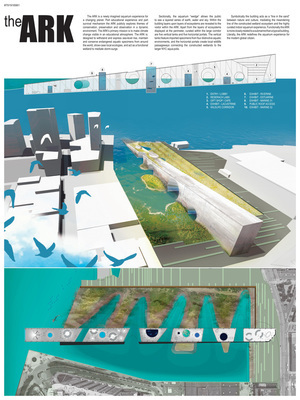 This idea will make people pay attention on the water movement and feel the river as an alive part of the city. 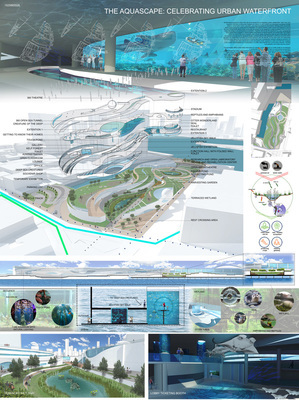 The Aquarium is located underwater with a small portion that rises up, just as an amphibian living in both worlds, making a connection between earth and water. The Queens Oceanarium showcases the diversity of life on earth through the lens of the people of Queens, which boasts the most diverse urban population in the world. 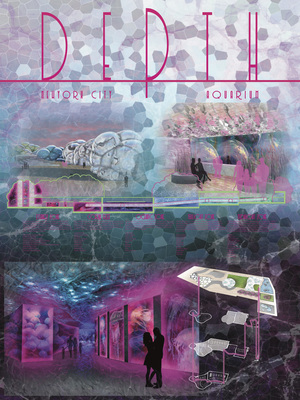 Visitors travel through Six Marine Realms reflecting the origins of the borough's inhabitants. The first and largest display is a Caribbean reef, since more than 1/3 of Queens immigrants come from countries along the Caribbean; the next tank features the South China Sea, and so on. This is a place for making novel connections—for seeing the diversity of the oceans through the diversity of a city—and it could only exist in Queens. Can you imagine not knowing who you are? Contained within four walls - never knowing beyond them. No window. No door. No exit. An obscure creature brings you food each day. You will live, then finally die within these walls. Never knowing if there was anyone else like you. 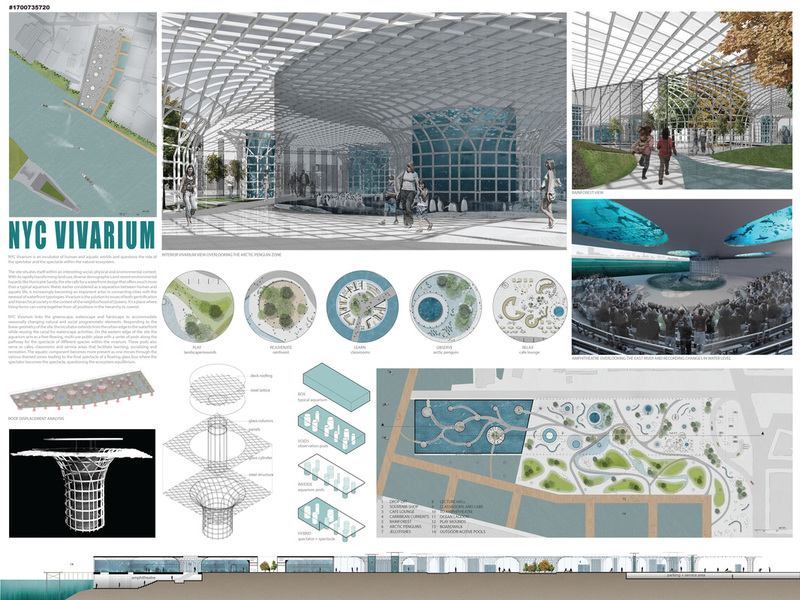 propose an Aquarium. 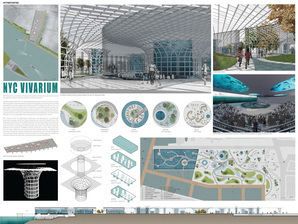 Instead we propose the History of an Aquarium. 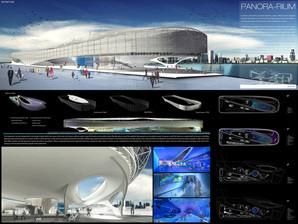 The concept is evolved with the intention to break the monotony in the skyline on New York City. 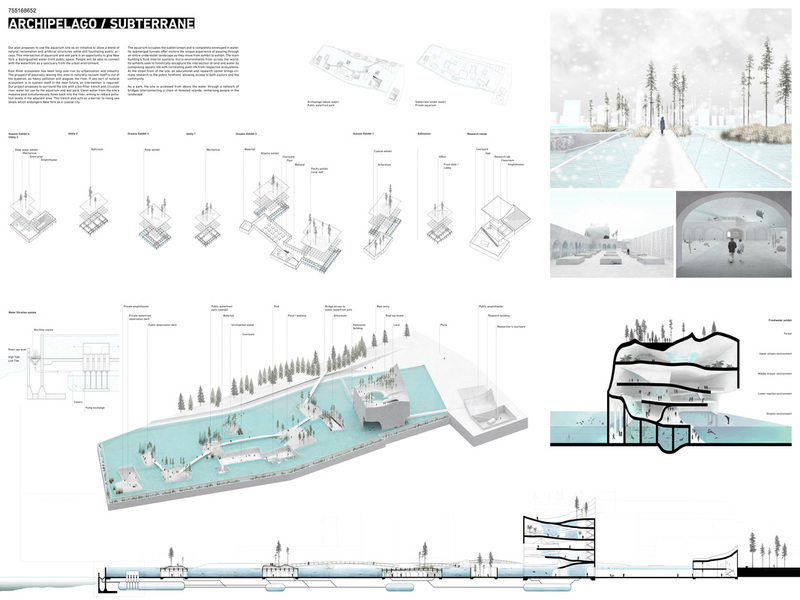 A fluidic form, apt for the design program, not only satisfies the requirements but create a new perspective of how the spaces could be arranged too. 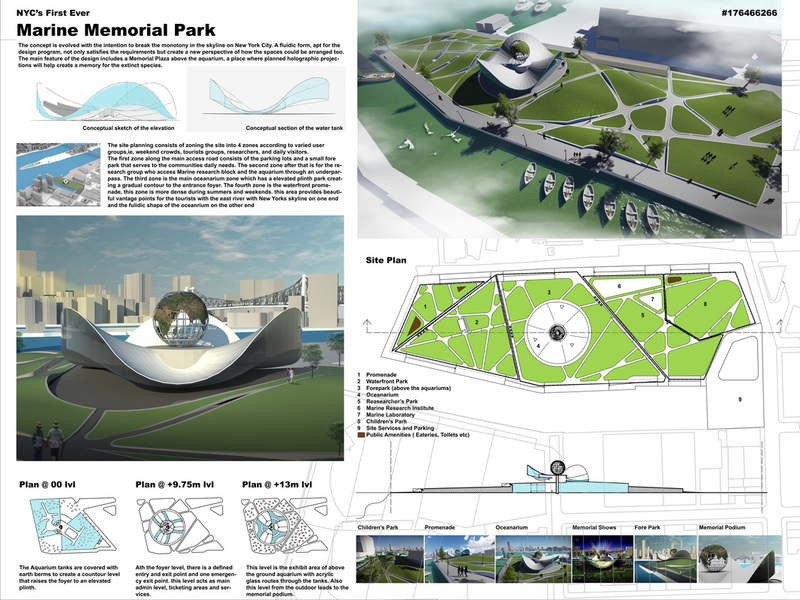 The main feature of the design includes a Memorial Plaza above the aquarium, a place where planned holographic projections will help create a memory for the extinct species. deepest depths of the ocean.